When my neighbor was born in 1930 world population has reached 2 billion. Norfolk four-course crop rotation: Fodder crops, particularly turnips and clover in place of fallow. The four-field rotation system allowed farmers to restore soil fertility. Turnips is reported as early as 1638 but were not widely used till about 1750. The consequently increase in the food supply contributed to the rapid growth of population in England and Wales, from 5.5 million in 1700 to over 9 million by 1801. The rise in population added to the urban workforce. The Agricultural Revolution has therefore been mentioned as a cause of the Industrial Revolution. With photosynthesis only Denmark has enough arable land to feed one million people on a pre-wartime diet and the world may feed a billion - and this without creating environmental problems - Tenfold provides self-inflicted problems. - Her methods may not be pleasant ones. About 70,000 years ago the eruption of supervulcano Mount Toba drew a curtain for the sun and a thousand years of ice age began. Humans (Homo sapiens neanderthalis) were nearly wiped out and their numbers are estimated as low as 10-40,000. Since then population has increased and is no longer sustainable by the photosynthesis. Hopefully mankind takes control before Mother Nature do - Her methods may not be pleasant ones. In the meantime we at International Starch carry on improving our technology with still better utilization of energy, water and raw materials and we carry on improving methods of recycling wasted nutrients and effluents to the benefit of nature. New technology has from time to time broken barriers limiting population growth. Bringing in fossil energy into agriculture - first as bird droppings from the Guano Islands (1840), then as coal and petrol - removed the energy limitation and gave rise to a most dramatic expansion in human numbers. Before industrial age took effect for real, population was still sustained by the photosynthesis with ample room for other species and a negligible pollution. This is no longer the situation. How to halt and how to reverse is a matter of politics. Unfortunately the perspective is beyond next election day and not a cause for a vote catcher. Watch the Population clock here. Source -10000-1: US Census Bureau by various authorities. Source 1-1500: J.D. Durand, 1974. Historical Estimates of World Population: An Evaluation (University of Pennsylvania, Population Studies Center, Philadelphia). Source:1500-1900: United Nations, 1973. The Determinants and Consequences of Population Trends, Vol. 1 (United Nations, New York). Source: 1900 - 2000: United Nations, 1966. World Population Prospects as Assessed in 1963 (United Nations, New York) and United Nations, 1993. 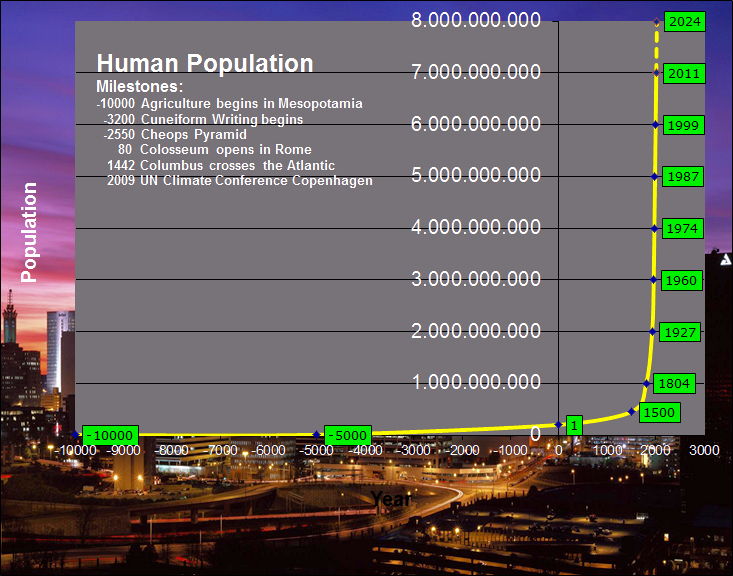 World Population Prospects: The 1994 Revision (United Nations, New York).